Mama’s Got a New Bag! Last week I started cutting pattern pieces for Noodlehead’s Campfire Messenger Bag. There are many pieces to this bag. There is not only the main, lining and accent fabrics, but there is also the fusible fleece and fusible woven interfacing pieces. Sadly, I am not the most organized when it comes to sewing- so I tend to cut woven interfacing as I move along with each fabric piece as needed. YOU would think I would learn, and cut all the lining pieces ahead of time, but no, I don’t- I just continue to use my method of madness. Oh well, what are you going to do? I did get a pretty nifty bag out of the whole deal, so I guess in a way my method worked! The Campfire Messenger Bag, in my opinion is a MUST MAKE and should be put on the top of all of your “to make” lists! It has just enough pockets both inside and out. The backside of the bag has a snap pocket, and once you open the flap there are 2 roomy and easily accessible front pleated pockets. There is a zipper pocket above those pleated pockets, and on the interior side of the bag, you have two pockets, side by side. There are many options that Anna presents you with in her pattern for flap closures, heck, I may try them all. Why not? I did go with the snap closures for this particular bag. I feel it gives this bag a nice clean look, very professional. There is also an adjustable strap that makes it easy to wear the bag either “cross body” style or just over the shoulder. This bag is roomy enough for all you essentials and then some. I don’t have an iPad, but I am pretty sure that would fit also! I basically used the fabrics I had around already. I had some Cotton and Steel fat eighths on hand and I used these for the flap and linings. This particular collection of Cotton and Steel looks really great with navy blue so… I constructed the strap, snap closures and bag binding all in a solid navy blue. I think from these photos, it may look black, but it is a very, very dark blue. I didn’t have a navy blue zipper of the correct size on hand. So I opted for an ecru instead. I also did not add the zip bag closure (optional) for top of the main part of the bag. My friends went wild when they saw my Campfire Messenger Bag. Then they went even more wild when they found out I made the bag!!! I hope you make this bag and enjoy the process as much as I did! One more thing also, I am having a pretty nice giveaway through my instagram, @Traceywirthdesigns. Hop on over to instagram and follow the qualifying rules. The giveaway closes on Monday September 26th at 5:00 pm PDT. Best of Luck for those who enter! Hanging with Doris Day – A Dream Come True! Actually It is a dream, but it didn’t come true- at least not in real life. I entered another Burdastyle Sewing Challenge. 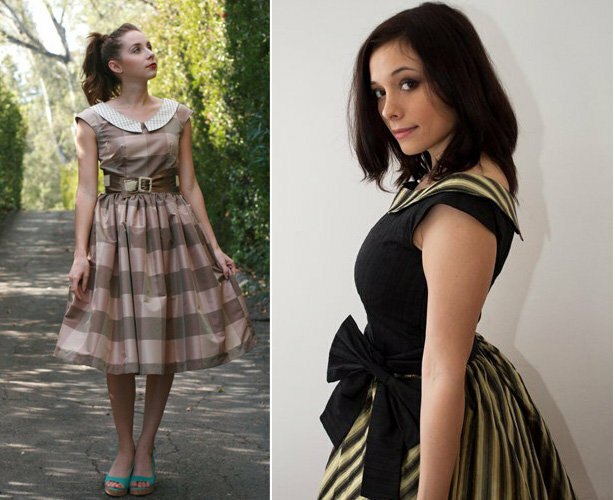 The Burdastyle Sewing Vintage Modern Contest. 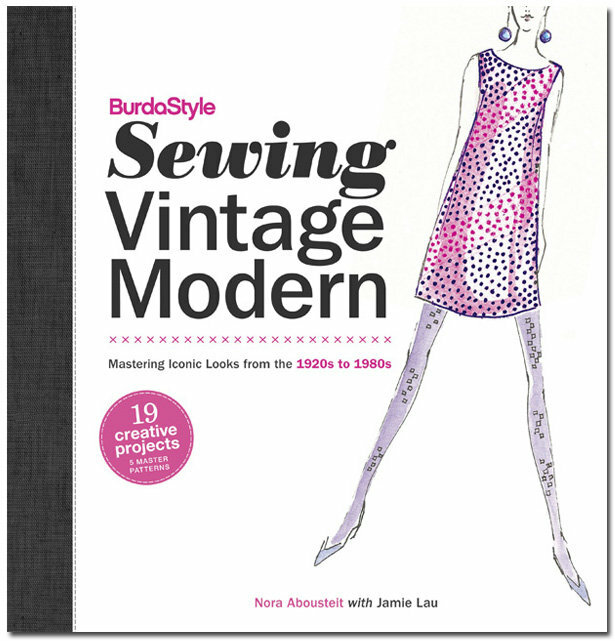 The idea of this challenge was to use the NEW burdastyle Sewing Vintage Modern book as the starting point for your actual garment entry. I chose the Jamie Dress, which is a 60’s basic shift dress. I traced the pattern to some brown craft paper and then added the 5/8″ seam allowance and from there I sketched many sketches. I chose existing fabric from my stash. I was pretty happy about that. Both these fabrics were purchased from Joann Fabrics weeks prior. It probably didn’t help any that I may have added too many details (my second mistake?). The neckline has a placard detail, I added small flap pockets on the hips, surface cording and button details were also added. Admittedly there is a lot happening with this dress and to this dress. I was happy with how it turned out. I haven’t decided if I will actually wear it. The best part my garment entry was my photo shoot. One of the requirements for the contestants, was that they were to not only sew up a great garment, but they also were supposed to make the photographs interesting. So this is where I believed I shined!!! Feast your eyes! Yes! That is me hanging out in Doris’ 1960’s kitchen. She is also holding the Burdastyle Sewing Vintage Modern Book. My brilliant son Kenny photoshopped this for me- Isn’t it awesome! It almost seems real! There were some pretty soured people who entered the challenge. I was surely disappointed with the admissions process, there were some glitches. I do need to remind myself, that even though it would have been great to have won, the process of creating this dress, and the photograph that I now possess MAKE ME VERY HAPPY!!! By now I am sure you have discerned that I didn’t make the cut from 80 contestants to the 20 that the burdastyle public then were able to choose from. No worries! It is a shame, that folks can’t just keep negative comments to themselves and congratulate the very deserving winners! Here they are! The Grand Prize goes to Community Choice Winner, with 557 votes, Elochka for her Scala Dress. Her dress is on the above right. 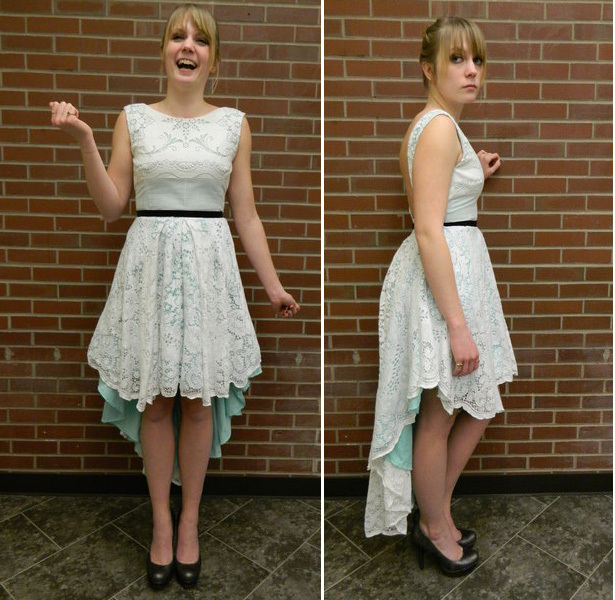 The BurdaStyle Community Choice Runner-Up, with 455 votes, goes to Gurda8 for her Dream Date Dress on the above left. Anyway that’s the skinny! Please enter to win my give-away, because that makes me happy also!!! The Colette Pattern Blog Site Coletterie is heading up a sewing challenge. The idea is to create a moodboard, which is what I have done here…. and then sew a mini Spring/Summer wardrobe. I chose a palette of white, yellow, gray and navy and periwinkle blues. I am also incorporating the new Colette Pattern, Iris (shorts), a sundress (sunny day sundress) by Jamie Christina, another pair of Summer Clovers (Colette Patterns) and a few other surprises using the blue and white polka dot fabric from my moodboard. You can never go wrong with polka dots! If you would also like to join, hop on over to Coletterie and grab a button. Sewing has killed my shopping bliss! I don’t know about you, but I find some of my inspiration from what is going on in the retail world. Current fashion trends don’t really interest me, I am more influenced by “vintage inspired” new clothing with a 50’s flair. One of my favorite afternoon outings is a leisurely browse through our local Anthropologie store in Corte Madera. I especially like going on a Tuesday when they have the start of their weekly sale wink, wink. Lately though I find my shopping bliss has been murdered by my enthusiasm to sew. This is a strange statement I know, but have you ever found yourself in a store looking at a particular item and saying, “why buy this when I know I can make it?” Those on the outside look at you with eyes of envy because You Can Make it, but on the inside you know that you are NEVER going to get around to sewing, crafting, cooking, knitting or making that specific thing, BECAUSE you cannot stop time. Time stands still for no man or woman. Just today I joyfully entered our Anthropologie store and quickly had that feeling again when I saw this lovely vintage inspired dress. Yes, I know I could make this lovely frock, unfortunately I cannot stop time. If only we had more time in the day, right? This is another dress that when I saw it I had intentions of sewing I saw Emma Stone wearing it in the movie The Help- I so love this dress! Isn’t it amazing?- I am not sure if there is a name for this Peggy Hunt inspired neckline, but it just makes me swoon! Sarai did a really nice nod to Peggy Hunt on her Coletterie Website displaying many of Ms Hunts’ gorgeous creations. Colette Patterns and Coletterie offer an immense amount of sewing education for a sewist of any skill level. When I have sewing questions I often always look to Coletterie for answers. So to say that sewing has “murdered” my shopping bliss, is pretty harsh BUT I have to say that the last 6 times I departed Anthropologie, I was empty-handed, but with a mind full of many thoughts for future projects. The reality of THIS sewist (and to sew this blog up-arr arr, I couldn’t resist)? Purchasing clothing off the rack doesn’t really float my boat anymore, BUT buying yards and yards of fabric, scads of sewing patterns and notions gathering inspirations from shopping and movies makes me blissful and floats my boat! What’s your Bliss and what floats your boat? Has sewing ruined shopping for you as well?